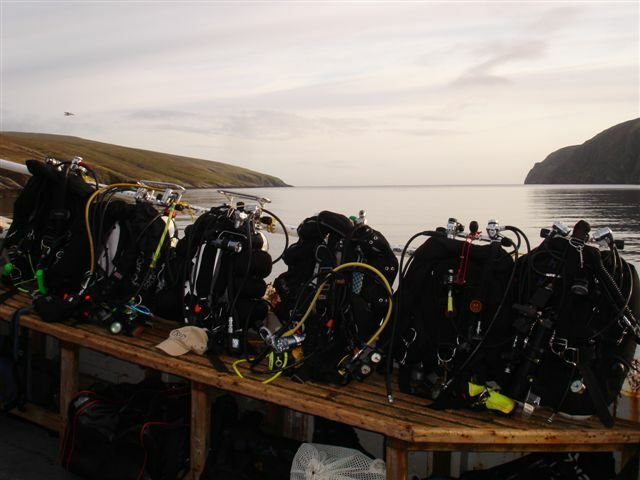 After an excellent expedition the previous year which was organised by Dave Robson, it was decided to go again, to do dive some of the better sites we’d done last year, plus explore some new ones. The final expedition team comprised many members from Tyneside 114 BSAC but also a couple from Durham City Divers BSAC, West Cumbria BSAC and Blyth BSAC. Early start today. Planned departure time was 7.00am with the intention of making Aberdeen by lunchtime. Steve Hughes our resident club member in Aberdeen had booked the Ferry Hill Hotel for lunch; I think he was a bit surprised when everyone turned up on time. So far, so good. It wasn’t to last. Despite advising the ferry company that we were a group of divers and would be bringing scuba equipment, well in advance, we turned up to be told to dump the air from the cylinders. Last year, this hadn’t been a problem, so obviously it was a bit of a surprise. Customers were therefore rather angry at this unexpected news! Eventually common sense prevailed, and the cylinders were loaded into a car and taken on the ferry. Full cylinders were ok in a car apparently whereas full cylinders on the luggage racks provided weren’t. Up to this point we’d been very happy with Northlink ferries and their customer service but it is clear that there is confusion in how they should look after divers from Aberdeen ports (despite also looking after divers from Scrabster to Orkney). 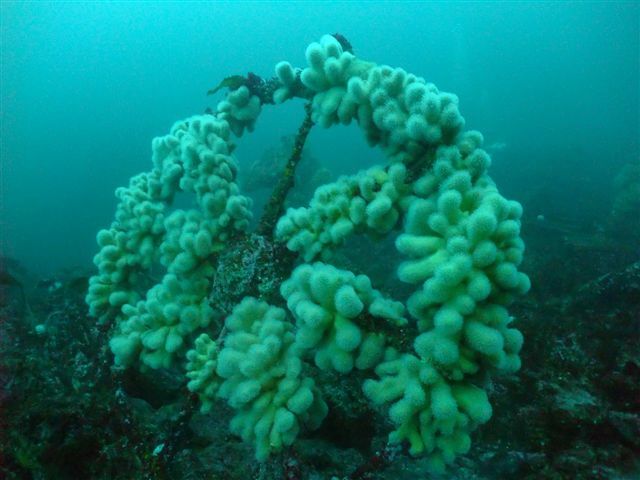 Given the amount of grief they must be getting from travelling divers we hope that procedures are soon put in place to look after their diving customers and not simply put them off from travelling with Northlink, which is a very convenient and easy way to get to Shetland. We have travelled with the same and other ferry companies and provided you advise them you are carrying full cylinders and fill in the appropriate paper work it is not usually a problem. The journey across to Lerwick was uneventful. The Ferry seemed quieter than last year and we had no problem in finding space for 11 divers in the bar. Booking cabins however is definitely the way to go. After an evening meal and a few drinks, its great to crash in bed in comfort and arrive refreshed in Shetland the following morning (unless of course there is a snorer in the room). On arrival instead of booking taxis (easy to remember number 690069) we now had the car to transport cylinders to and from the MV Halton. Four short trips later all of our bags and the whole group had arrived on the boat. Once sorted we set off for a shake down dive at Score Head, probably the only sheltered dive site in the area considering we had a south easterly wind. 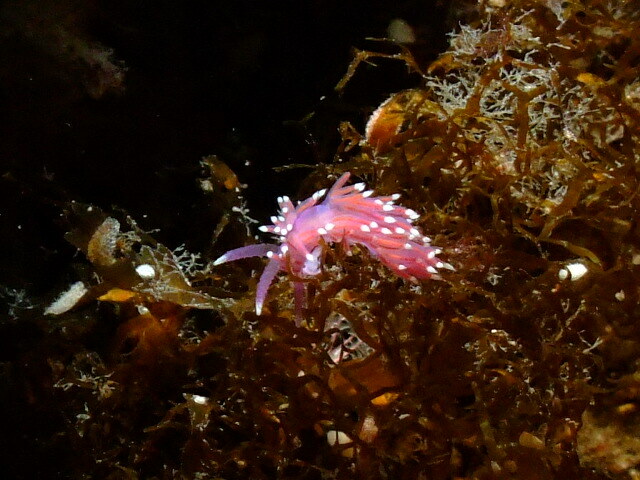 It was a wall dive with very little tide, so no anemones, but lots of kelp and nudibranches and a few dead mans fingers towards 10 metres down. Once out of the water we returned back to Lerwick. With all of the wet dive kit sorted, the shoppers were dispatched to Tesco and on cue the heavens opened in true Shetland style. Despite being a remote group of islands, the Tesco in Lerwick proved to be very well stocked and the shopping was all purchased without a hitch. The food provisions were then all packed away, lunch was eaten and off we set off to the second dive site, through the swell of the Atlantic Ocean…. Causing sea sickness to more than a few group members! 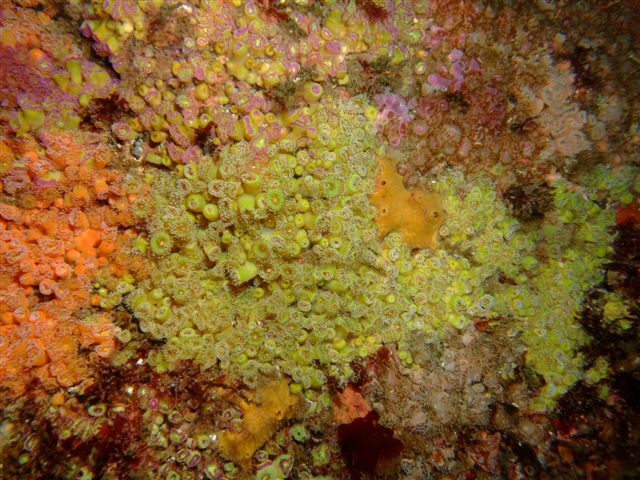 The second dive was a drift dive; over a mixed bed of horse mussels, huge brittle star aggregations and the odd rocky outcrop of dead man’s fingers. At points we reached about 3 knots, but as the evening light faded and more rain clouds arrived we climbed back on the boat for a welcome meal of sausages and mashed (liquidised) potato. The cooking score bar had been set at 5 out of 10….. Will it get better?? Monday dawned wet and windy and off we set through mounting waves to find and dive the E49, a British submarine sunk during the First World War. 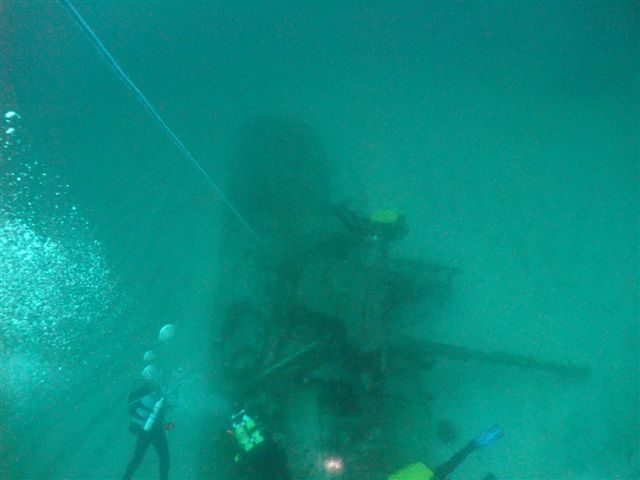 Everyone was excited at the prospect of this wreck but enthusiasm was somewhat dampened when the sea state was deemed the wrong side of ‘marginal’ to safely complete the dive and climb the ladder back into the boat. So the E49 was postponed for the time being, as we set off again with the prospect of another 40 minutes passage steaming into the teeth of the storm. Some of the team declared the morning over at that point and retreated to the safety of their bunks. The others, behind the senior diver of the trip, Andy Hunt (21! ), leapt into the sea and onto the Jane, a wreck lying on its side. The current was flowing strongly across the wreck and a considerable amount of energy was expended moving around it before most drifted off into the void. One pair of divers, after 30 minutes drifting managed to return to the wreck. It was then time to find an afternoon dive and unfortunately conditions to dive the Tonis Chandris were deemed unsuitable so it was back to the Jane for the second time. After the dive the boat retreated to the Balta Sound for the evening with group members visiting the famous ‘bus stop’ and local hostelry amongst other places. Steve unfortunately lost his camera lens on this first dive and despite an extensive search on the second, it was not found. The evening meal that night was chilli con carne with banoffee pie for pudding, cooked by Simon and Andy. Senior Chef Nicola helped supervise the cooks to avoid a repeat of yesterday’s liquidised mash wall paper paste. The sea state had died down and the sun was starting to shine (at times). We dived the E49 in a staggered wave so that there weren’t too many divers on the wreck at the same time. Another dive boat pulled up just afterwards and waited until our divers were clear before deploying theirs. The visibility was stunning, much better than last year. 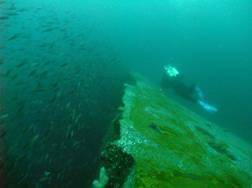 The outline of the wreck at 35m came into view from 10m, with shoals of fledging Pollack patrolling the wreck hunting huge shoals of fleeing sand eels. 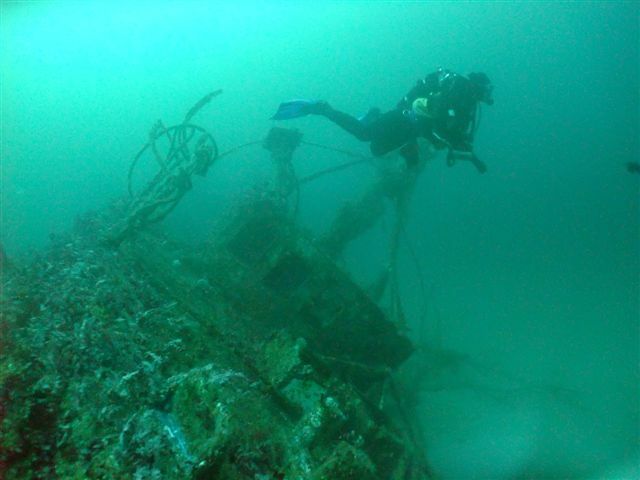 We didn’t let this sight detract from the amazing wreck as any fish could be moved to improve the view. Once all f the divers had been safely recovered, it was time to move on to the next dive site, the wreck of the SS Tonis Chandris for the second dive. Bob’s instructions were to return up the shot at the end of this dive, words that sent tremors of fear through some of the group. The wreck itself was well broken and largely covered in kelp which extended down to 25 metres. Perhaps the highlight of the dive was the ship’s emergency wheel, which still remains proudly standing upright. Some made it back to the shot and others ascended under high visibility DSMs, the names of the guilty and the innocent have been lost in the history of time. 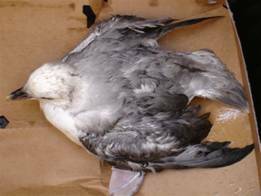 After mooring up, Bob the skipper and Grigor his trusty crewman, launched the inflatable and rescued a stranded baby sea gull, which after some rest in a rebreather box was returned to land. Whilst the cooks set about their business they took a landing party ashore to stretch their legs and experience land sickness. Andy and Fiona then prepared an excellent lamb tagine under the watchful eye of self appointed Senior Chef Nicola, who barked instructions as appropriate, whilst poor Simon watched on, as he was regularly reminded what a lovely wife she would make. Fabulous spot to moor up although the radar dome on the adjacent hill tended to spoil the sense of remoteness a little. After a night in Burra Firth the morning dawned bright and sunny. Bob Anderson started his briefing after confirming the intended first dive site was Muckle Flugga Outer Stack by giving the salient warning of the need to be careful as the next stop was Boston USA! The need for SMBs and flags was emphasised and whistles distributed to those without should the fog come down, common in south easterly winds in the Shetlands which were being experienced. Turning to the dive itself, firstly it was a swim to the Outer Stack and then a descent into a gulley which ran along its side. The walls of the gulley were covered in life as could be expected in an exposed location such as this. The maximum dive time was quickly reached and it was time to ascend once again followed by a long fin out to the Halton, it not daring to come in too close the seabed in this area not having been mapped to any great detail. It was during this dive that the third drysuit boot of the trip came to a tragic end! The positive outcome of this was that junior Andy managed to put on senior Andy’s spare drysuit with room to spare except around the crotch, which was rather tight. Clearly Sibylle’s weight reduction programme is having a beneficial effect and can now be suspended. The sojourn between dives was spent with Fiona admirably undertaking the role of model posing for numerous photographs of Muckle Flugga Lighthouse. 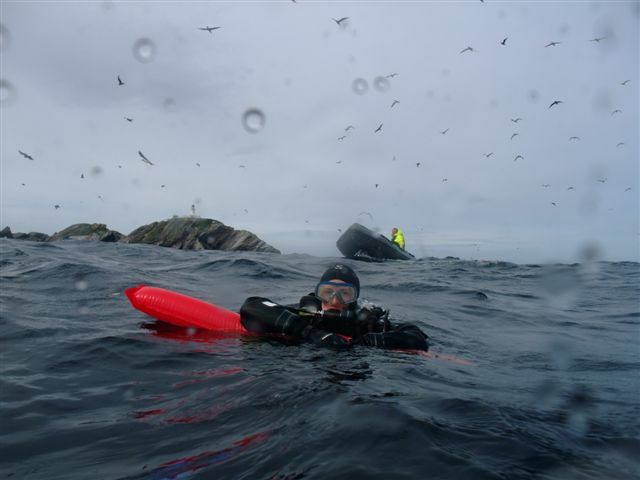 It was then for the second dive of the day which this time was to be under the Muckle Flugga Lighthouse, a dive site quite possibly never previously dived! This time diving was to take place from a Gemini, an interesting transfer having to be made in full kit from the Halton to the inflatable. Those that descended into the depths were met with reasonable vis, kelp down to c. 20 metres and interspersed with walls and other areas covered with jewel anenomies and other squiddy beings. Again the maximum dive time was soon reached, recovery for some was into the Halton and the inflatable for others, depending on where divers had surfaced. It was then time to steam south along the western side of Unst before crossing through Colgrave Sound through to the Out Skerries to be well positioned for Thursday’s planned diving. During the voyage under the instructions of Senior Chef Nicola a beef and Guinness pie was prepared. As could only be expected it was a 10 out of 10 meal, she will make a lovely wife for someone! Nicola and Sarah cooked tonight with onion chopping assistance from Dave. On the menu was an excellent home made beef and Guinness pie with mash (not liquidised) and a splendid home made apple crumble. Some of the troops were getting withdrawal symptoms from a lack of rust on the dives. We headed back towards Lerwick to dive some of the more popular Shetland wrecks. 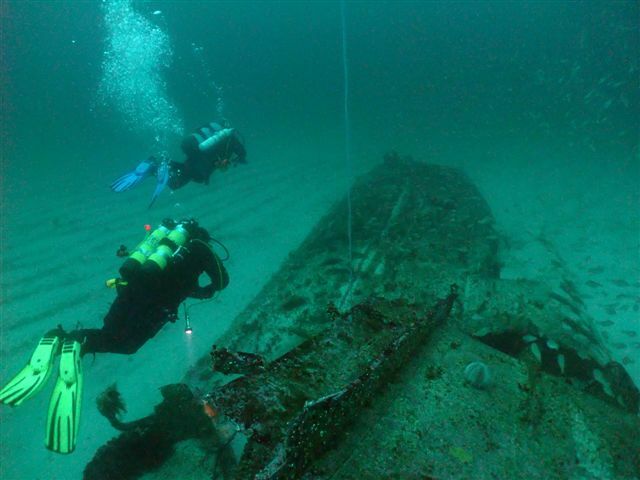 First dive up was the Glen Isla a steamship bolt upright in about 45m with the deck at 40m. 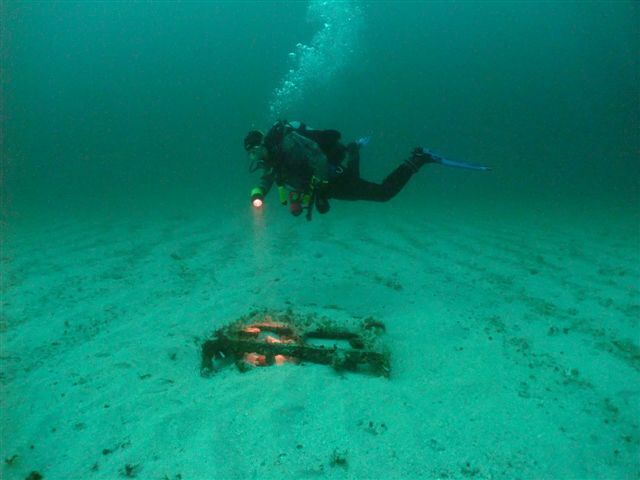 Although anything shiny has long since been liberated from the seabed it is still a relatively intact and interesting wreck, especially in the 20m visibility. Don’t bring up anything looking like cheese though; bits of phosphorous are dotted around the wreck which explodes on contact with air. A curious seal was also playing around in the stern on this particular dive. Some of the group preferred a shallower and more scenic dive and so dived the Lukonods. Having said shallower, the bows are still in 40m but the rest of the dive can be spent working your way up the slope. Visibility on the bows was fantastic as were the shoaling fish. The swell near the surface made exits interesting and there were a few nervous moments on the boat when DSMB’s popped up in the surface. Fortunately divers surfaced outside the white water to be collected in the inflatable and ferried back to the mother ship. Second dive was the Pionersk, a more recent Russian fish factory ship which had run aground and then sank. Rust a plenty but given the relatively shallow depth not much which was particularly shipshape. Still bits of brass around which is quite nice to see. Also lots of stainless steel food preparation equipment and the golden tin lids, remnants of the ships food processing past. 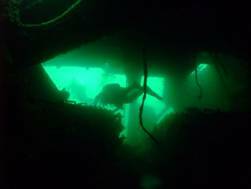 One particular section of the wreck provided the background for some atmospheric photographs. Later, Andy and Fiona cooked a chicken curry and prepared a lemon cheesecake (a la Nigella Lawson). The boat headed off to find a friendly bar for a quick drink. Finding a friendly bar initially proved a little tricky, but the upper lounge bar provided a warm welcome (compared to downstairs) and also had a local folk music group playing live fiddly, diddly music. Superb. 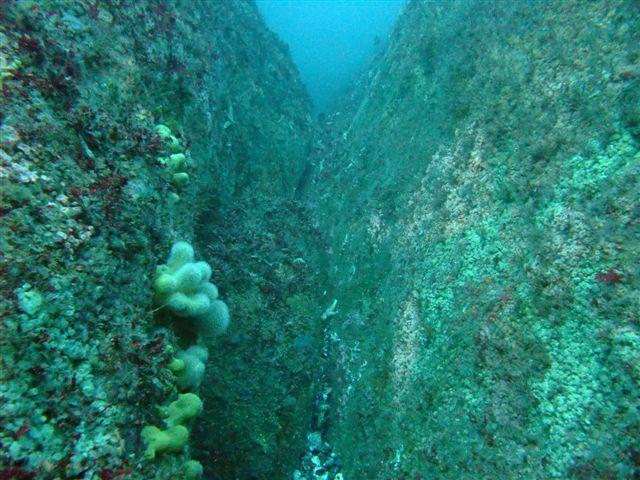 Last day’s diving and it kicked off with a dive on the Gwladmeana, another popular deeper wreck out of Lerwick. Sitting on the bottom in 38m it is slightly smaller than the Glen Isla and a bit collapsed at the rear. A solitary fire hose is an interesting feature in the bows. For the second dive we were originally planning to dive the Giants Legs, a nearby scenic dive off Bressey. However, the NW wind, even though growing to gale force had not diminished the SW swell sufficiently to dive the site safely. Instead we headed round the corner to dive the Froach Ban, the recent wreck of a fishing vessel. This was an excellent dive to finish on. Lying in 28m on its side on a white sandy seabed, the Froach Ban is intact. It was initially obscured from view by a massive shoal of Pollack which moved out of the way of divers and then returned once they left. A very atmospheric dive. We drained the cylinders before boarding the ferry this time. Gale force winds and significant boat motion marked the return journey. However, compared to the roll of the Halton in the Atlantic swells it was nothing and we made the most of the extra space in the bar talking diving with another group of divers from the North East. And that was it. Another week long expedition had flown by leaving much still left to explore. Underwater photography by Nicola Faulks. Surface shots in this report: Andy Hunt.